carrying with them dreams of flowers!" The Flora Bloom Bouquet Collection……it all started when……..
A mix of genealogy, etymology and DNA created this story! Lois is the daughter of Flora Bloom (really!) who loved nature, words and the spiritual, and also the granddaughter of Hortense (“hortis” is garden in Latin!). Hortense Ulmer married Harry Bloom, parenting Flora Bloom! 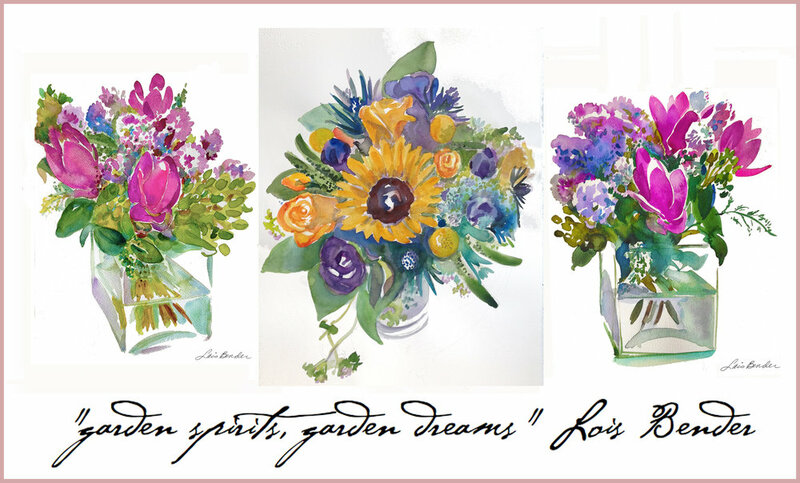 Blessed with this “garden” pedigree, Lois named her Flora Bloom Watercolor collections naturally after her mother. Emigrating from France to New York in 1849, four generations of her family alternated the given names Flora and Hortense and Hortense was Lois’s turn! But the name was not given! Instead, Painting the story Lois’ gift, channeling the spirit of her mom’s love of gardens in an alchemy of dynamic design and poetic imagery into her watercolor collections.